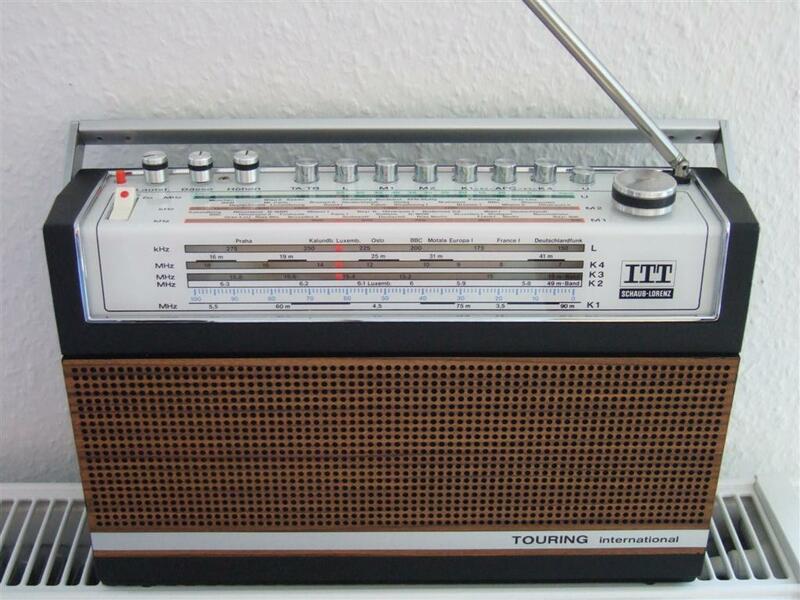 One of my favorite multi-band radios is the German-made ITT 103, or more properly, the ITT Schaub-Lorenz Touring International 103. Why such a lengthy name? In Germany when companies merge they also merge their names. So when International Telephone & Telegraph (ITT) merged with a company that resulted from a merger between Schaub and Lorenz, the new name became ITT Schaub-Lorenz. The top of the line products from ITT Schaub-Lorenz were known as the TOURING line. For this article we’ll take a look at the “ITT 103”…the model I own, but most of this information also applies to several highly similar models, the original Touring International, followed by the numbered models, ITT Touring International 101, 102 and 103. The 101 was produced between approximately 1970-1972, the 102 from 1972-1973 and the 103 between 1974-1975. In 1972 an ITT 102 sold for 272 Deutsche Marks, or about $200 US. 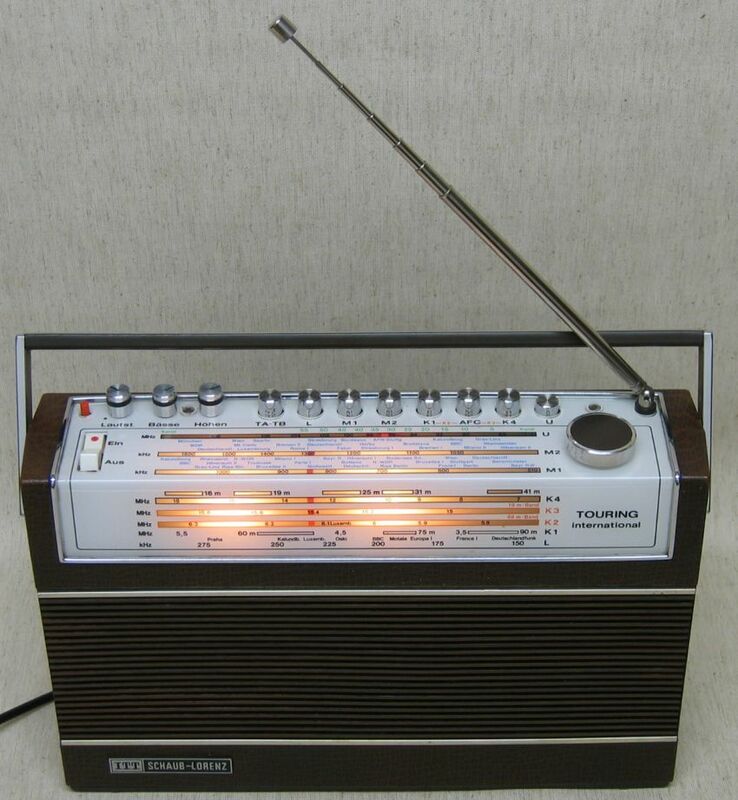 Consider that a Grundig Satellit 6001 sold for DM 798 and it becomes apparent that the ITTs were considered daily player radios as opposed to the more specialty market occupied by radios such as the top of the line Grundigs of the day. With that in mind, the performance of these ITTs in some areas is remarkable. Model differences: The original and 101 models have a Car DC input jack which was deleted in the later models, but those later models have a built-in AC supply. The 101 has the advantage of a separate antenna switch to disable the built-in antennas, while the 102 and 103 replaced the combination On/Off Volume control of the earlier models with a separate On/Off rocker switch and also added full-time illumination when operating on AC power, as well as an auxiliary audio input switch. The ITTs use the European standard DIN input output jack. There were also some minor cosmetic changes and each model was available in different color combinations such as wood-look, black or “waffle grille”, and black or brown sides. However the basic circuits and performance are for all intents and purposes identical so my listening comments here will apply to all. Layout, Features & Specifications: The ITTs run on 6 D cells, AC or Car DC (external DC only on original and model 101). The dual speakers are driven by an unusually powerful amplifier capable of delivering a full 2 watts of power at 1% THD on batteries, 4 watts on AC power and 5 watts from external DC power. If you are not familiar with power specifications in portable radios, these numbers are incredible and go way beyond any other portable radio I’m aware of…most radios struggle to produce even half a watt of power at much higher distortion…even some that are considered quite good sounding. Modern radios are typically rated in milliwatts (mw) of output power… 2 to 5 watts is simply unheard of. The ITT covers standard AM from 512 – 1630 KHz, LW from 146 – 284 KHz, FM from 87.5 – 108 MHz and SW in four bands: SW 1 – 3.1 – 5.5 MHz, SW 4 – 6.9 – 18.1 MHz and two spread bands: 49 meters from 5.8 – 6.3 MHz and 19 meters from 14.9 – 15.9 MHz. 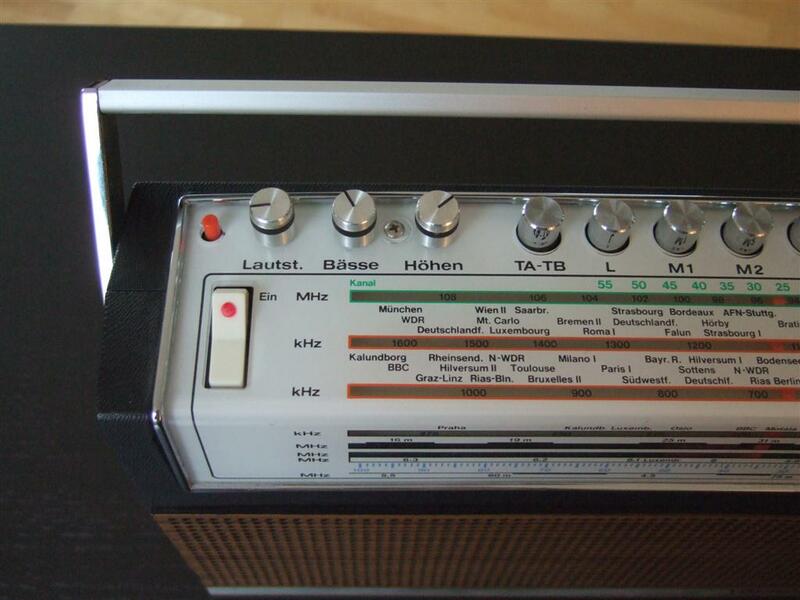 The AM is actually divided into TWO bands with M1 covering 512 – 1070KHz and M2 covering 1000 – 1630KHz. AM tuning is thus extremely accurate for an analog radio. Another neat feature is that the FM tuning is separate from LW, AM and SW so, for example, you can leave the FM tuned to a station while you tune around on the other bands…a very nice feature. Dimensions are approximately: 13.5” Wide x 9” Tall x 3 ½ Deep. There is pushbutton dial illumination, plus the 102 and 103 are illuminated full time when operating on external power. Another unusual feature is a built-in SW Loop Antenna for SW. In strong signal conditions you can collapse the SW whip antenna and use the built-in loop and gain all the advantages of low noise and directivity for which loops are well-known. Although this loop is most effective on the lower SW frequencies it does have effect even at higher frequencies. 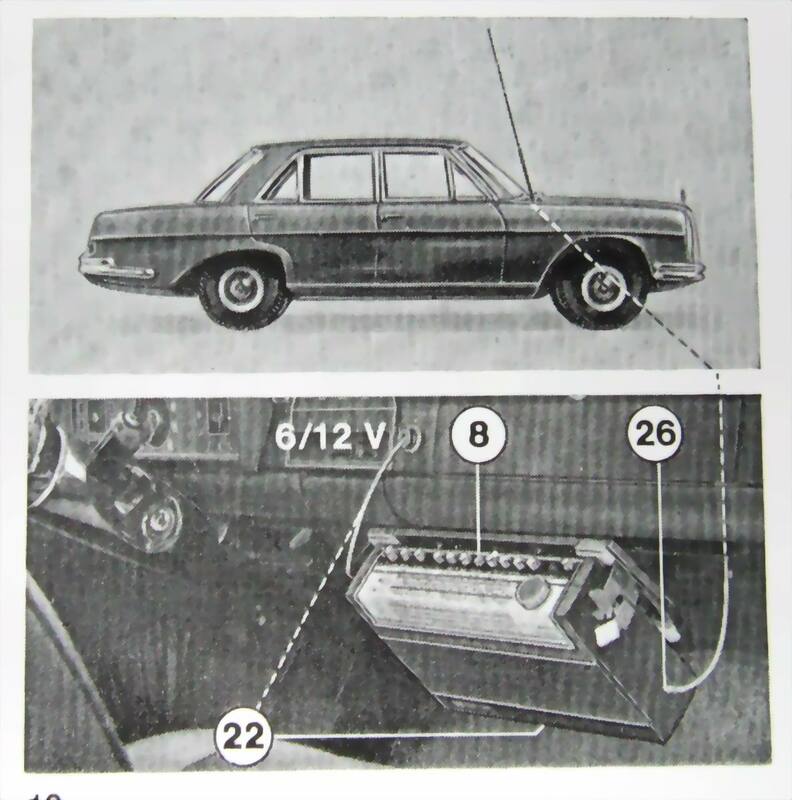 The ITTs also feature an automotive-style Motorola antenna plug for use in a car…there was also an optional car kit available which allowed under-dash mounting. Performance – AM: The RF performance of the ITT is quite good on AM. I rated it as a Four Star RF performer in my AM Radio Mega Shootout. It pulls in weak AM signals very well…trace signals at the threshold of detectability are presented almost as well as my very best AM radios. The Five Star radios are just a bit less hissy on medium strength signals but the ITT is no slouch in raw sensitivity. However the ITT is highly selective…it was designed for the densely-packed European SW/MW bands…it not only separates signals which run together on other radios…it sometimes lets you hear blank space between them. On SW I would describe the ITT is good. I do have more sensitive SW radios, but the ITT has one advantage..it makes most signals you would actually listen to very listenable. I think this is a combination of its superb audio (which I’ll describe in detail) and a very well-timed AGC (automatic gain control) circuit which tends to minimize the annoyance factor of fading SW (and AM) signals. I compared many fading SW signals with my Sony 2010…even with the 2010’s sync engaged, the ITT was far more listenable…the fading just seemed less noticeable on it. FM reception is also very good and quite sensitive but with a few out of band signals seemingly breaking in at a few places on the dial. But my typical FM stations all come in fine on it and are a joy to hear in such high fidelity. OK…let’s discuss the sound…the ITT’s forte. Sound Quality: In this area the ITT absolutely amazes me…it is in a different category than any other portable radio I’ve ever heard…the only radio that matches it for audio is the much larger, boombox-sized Grundig Satellit 600/650…a radio literally 4 to 6 times the size of the ITT. I already quoted the amplifier’s power capabilities…2 watts on batteries, 4 watts on AC and 5 watts on external DC . But amplifier power is only part of the story. Clearly the dual speakers and other circuitry are also of extremely high quality because the ITT is one of a very few radios which can be discussed in high fidelity terms. A look at the comany’s history provides some insight as to why the ITTs sound so good. Lorenz was a telephone and telegraph company founded in 1879/1880 manufacturing speakers and amplifiers. In 1920’s and 30’s they made radio broadcast equipment and they also designed professional auditorium speakers. Most radio manufacturers outsource the speakers to other OEM manufacturers…not ITT. Their speaker is just one of the reasons these radios sound so superb. Compared with other radios the ITT produces a deep, taut bass with awesome definition, along with very open and detailed midrange and treble. You don’t just hear “boom”…you hear…and actually FEEL… well-defined bass with true detail. In fact the entire audio range is articulate and convincing. You can actually feel the canons in the 1812 Overture at a good volume level on this radio…it’s nothing short of amazing for its size. Compared with other radios which are reputed to have excellent sound, the ITT comes away smiling. It happens that I work in radio broadcasting…I work in a production studio all day, recording and producing audio for a group of CBS Radio stations. Of all the radios in my collection, the ITT is the one that most closely approximates the sounds I hear in that studio. The ITT transports me back to the studio as no other radio I own. On AM the ITT’s sound is a bit darker than some radios, due to its extreme selectivity which mandates a narrower IF bandwidth. In fact there is a 5KHz notch filter to eliminate the whines often heard on SW when signals are on top of one another…that filter can be bypassed with a simple jumper wire and for use here in the US I recommend doing that. But even without that, the sound on AM is convincing due to the overall accuracy across the range covered. On FM the ITT really shines. Its audio is wide range, crisp and clean, with a solid bottom end that reveals the limitations of other radios one compares it with. I happen to be a big fan of the GE Superadios…primarily the I and II…they have great reception and sound, especially for the price, but the ITT’s sound is much more powerful and awe-inspiring…at higher volume levels there simply is no comparison. The ITT is my reference portable radio for sound quality. On SW the ITT offers solid although less-than-stellar performance. Reception is relatively sensitive and the spread bands make finding stations easy on those ranges easy. As I said earlier, for the majority of stations you would actually listen to the ITT makes them sound very stable and listenable way, but it’s not a SW radio for serious DXers…more suited to the program listener. 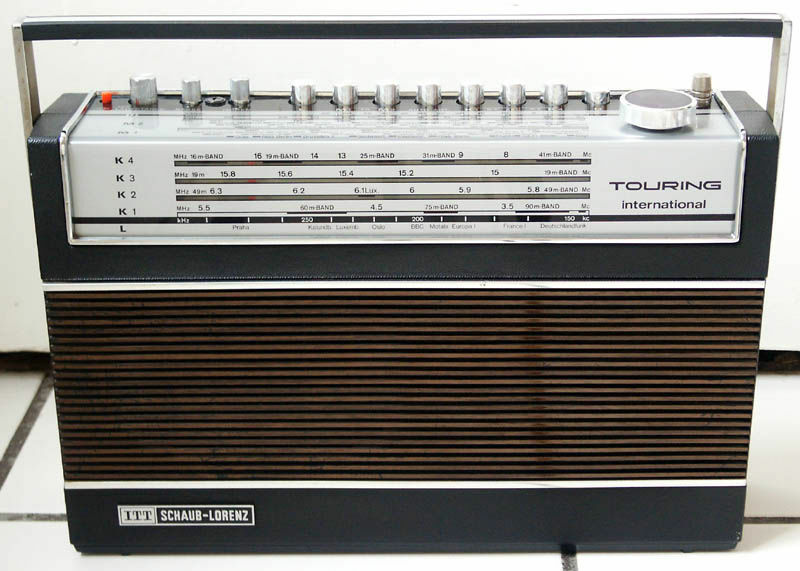 Conclusion: The ITT Touring Series radios were designed to please listeners who wanted first class sound…to push the envelope of how much accurate audio could come out of a medium-sized box. It really does resemble the sound of a small Hi-Fi system and gives you much more musical detail and impact than any other radio I‘ve heard anywhere near its size. When I want to play my favorite music through my home Transmitters, the ITT is the one I choose first. It feels like a precision instrument and looking inside it, it appears to be very sturdily constructed with reasonably good service access to most sections. 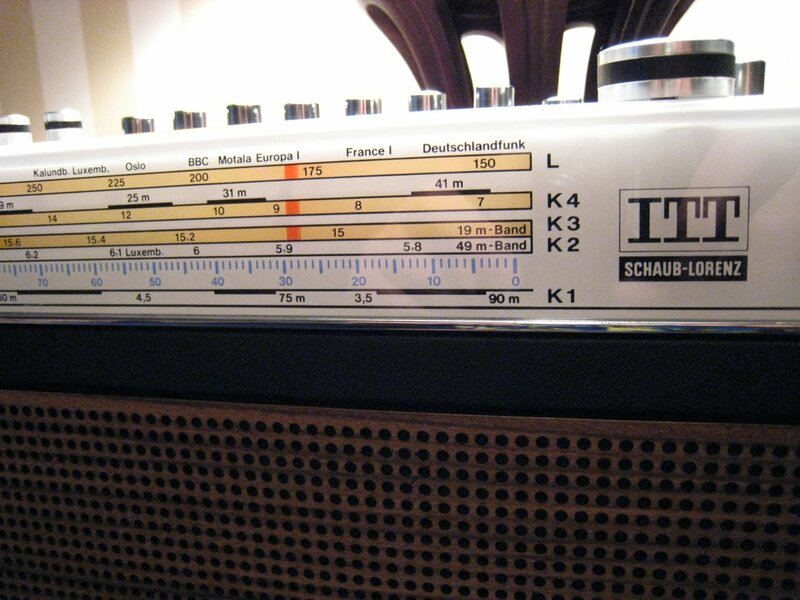 The ITT name might not be a familiar one here in the US but their Touring line of radios is one of my favorites.